Which Lightroom Alternative is Right for You? Are you looking for a viable Lightroom alternative to help manage your photography? If you are, you're not alone. Since Adobe moved Lightroom to be subscription-only, many photographers have been searching for an alternative. In this article, I’m going to introduce you to three great Lightroom alternatives that could save you money. Why Do You Need a Lightroom Alternative? Why don’t you want to use Lightroom? What are the important features you need to replace? This will allow you to select the best Lightroom alternative from the ones discussed. You might also realise that none of these alternatives is right for you. If you haven’t already done so, I’d recommend you read my article about choosing photo editing software. It may cover important points that you won’t immediately consider. What Should a Lightroom Alternative Do? Allow fast browsing of photos. Apply a rating factor to photos so I can quickly identify the best. Edit the metadata attached to photos such as copyright, location etc. View all shooting information for an image. Easily apply keywords to photos so that I can submit them to photo libraries. Have some way of marking photo usage, for example, submission to a photo library or calendar publisher. Search all my photos to find ones that match the search criteria. View and edit and convert photo RAW files. Editing must produce high-quality photos, especially when converting Fuji RAW files (I shoot with Fuji a lot and some software struggles to convert the RAW files). Have a version available for both Mac and Windows PC. It’s likely you will have some of these on your list but it’s equally possible you will have some more. Have that list ready as the recommendations that follow are based on my list. I also want to mention that I have personally purchased and use all the software packages here, although not necessarily to replace Lightroom. 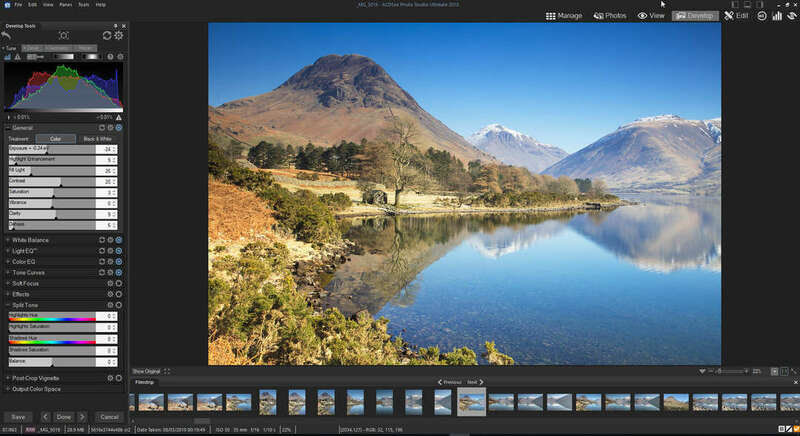 The Lightroom alternative that I want to explore first is ACDSee Photo Studio from ACD Systems. Whilst the software has been around for a long time, for some strange reason not many people know about it. That's a real shame because this is a quality product with a long history. In fact, I was using ACDSee well before Adobe released the first version of Lightroom. Standard – provides photo management only. Professional – is the same as the Standard version but also includes a RAW developer. This is an alternative to the Develop module in Lightroom. 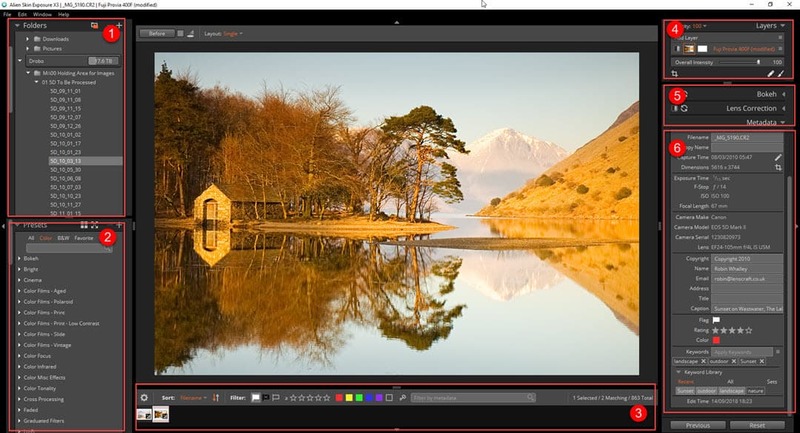 Ultimate - is the same as the Professional version but with the addition of layers support. You can think of this as being an alternative to Photoshop. Mac – is like the Professional version but for the Mac rather than PC. We can discount the Standard version as it doesn’t provide any photo editing. But the Professional and Ultimate versions (both for Windows) provide RAW file conversion and photo editing. The Ultimate version also provided Layers which is an integrated application with similar capabilities to Photoshop. If you’re also looking for a replacement for Photoshop, then definitely consider the Ultimate version. If you’re a Mac user, you only have one choice, but it’s very well priced and a viable Lightroom alternative. When you first access the software, it opens in the “Manage” view. This is a key part of what any Lightroom alternative should offer. The interface is clean and well laid out but there’s a huge amount of power here. It was only when you begin to take a closer look at the features that you realise how closely the software aligns to Lightroom. It even includes features such as smart collections and all very well implemented. If you are a power Lightroom user, you will be able to quickly transfer to this software. Here you can see the interface of the Manage module which you use to manage your photos. Along the top of the interface (1), you will see a series of modules. Each module provides a different feature. The Manage module is an alternative to Lightroom’s Library module whilst the Develop module would replace the Lightroom Develop module. Along the left side of the interface (2), you have a folder tree. Click a folder and you instantly see thumbnails of the images in the central grid. Click a thumbnail to select it and its information displays in the Preview panel (3). Over on the right side of the interface (4), you can see and adjust the metadata. All the features such as tagging, star ratings, colours and keywords are easily to hand. 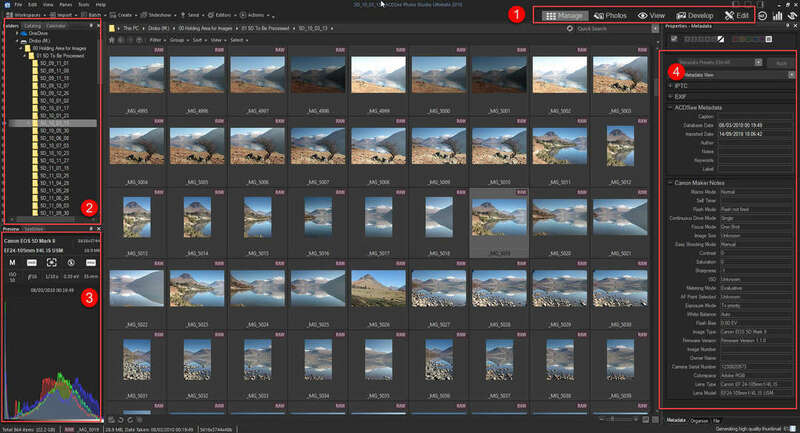 The main grid area also features many powerful sorting and filtering options to help find your photos. When you switch to the Develop module, the currently selected file opens for editing. The module is much more a RAW developer or photo correction module than an alternative for Photoshop. But if all you’re seeking is a Lightroom alternative, this may be perfect for you. Over on the left side of the interface are the Develop tools. These include everything you would expect of a Lightroom alternative. Many of the controls allow you to select an adjustment and then click and drag with your mouse on the image. The software is very responsive and produces nice clean high-quality images. Let’s move on to the next package as I could fill an entire book describing the features in ACDSee. Our next Lightroom alternative is Exposure from Alien Skin. At the time of writing this article, Exposure X3 was the current version of Exposure. Since then Alien Skin released Exposure X4 with further minor updates continuing to add new features. When you first launch the Exposure software, the interface appears quite simple and uncluttered. Despite this, the developers have managed to pack lots of functionality into a single screen layout. You can see an example of the interface here. I’ve tried to split the interface up into sections to help you make more sense and help you understand each area. This is a collapsible panel where you can select the drive or folder which holds your photos. When you select a folder location, Exposure scans it and displays a grid of thumbnails generated from the image files (including RAW). This is very fast and after scanning, the thumbnails are available as soon as the folders selected again. Exposure comes with a very large selection of Presets grouped into different categories. What’s great about this is that the Presets are film simulations. And very good film simulations at that. In addition, to apply the Presets that come with the software, you can modify these to save them as a new Preset. Or you can create your own Presets from scratch. Just below the Presets panel (just hidden from view in this screenshot) is the History panel. This keeps track of the changes you apply and allows you to easily undo changes applied in error. In addition to applying adjustments to your images, Exposure allows you to edit the image Metadata (covered below). Once you start to apply metadata to your photos, you can filter your images in the selected folder to display just those photos that match your criteria. Assuming you’ve done this well, you can quickly find any image in your collection. It’s surprisingly fast as well. Exposure supports layers when editing your photos. This allows you to apply a base adjustment on one layer and then further effects on other layers. For example, you can add a graduated layer to the sky and then reduce the exposure. The tools available here are very similar to those in Lightroom except that you can use every adjustment in Exposure on each of the layers. Each layer then has a layer mask attached allowing you to control where the adjustment’s applied. This is the section which holds all the controls you can use to adjust your RAW file or photo. Everything you would expect to see is here but there are a few others you might not expect. Rather than listing everything out, I’ve included a screenshot of the sections below. Overlays – where you can add film edges and scratches to your photos. The software includes some great special effects and the ability to import more. IR – which simulates the infrared effect very realistically. I’ve never seen this in any other software. In this panel, you can view and edit key metadata. The key elements you can apply include copyright information, captions, a star rating to indicate the best photos, flags and importantly, keywords. The tools appear a little basic in comparison but everything you would expect from a solid Lightroom alternative was here. By stripping things back to the most important elements, the software becomes much easier to work with. Overall, this is a great Lightroom alternative and a package that produces very good photographic results. 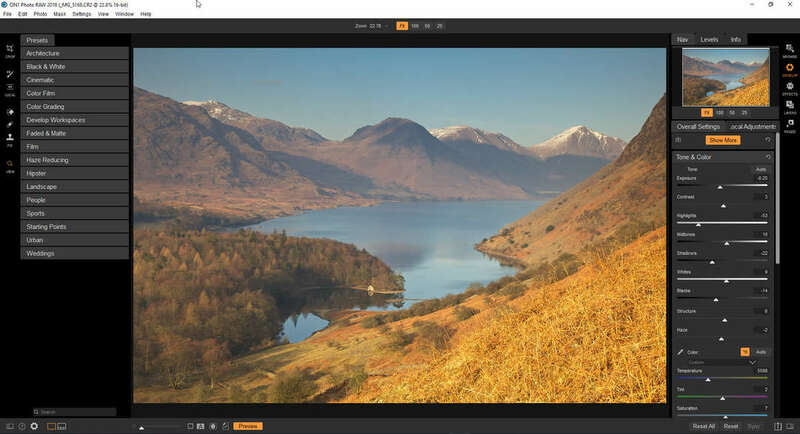 If you’re looking for basic photo management capabilities with creative editing tools, this is a good package to consider and a strong contender to replace Adobe Lightroom. You can download the trial software from the Alien Skin website. Our third and final Lightroom alternative is Photo RAW from On1 Software. I’ve been a long-time user of the On1 software and have seen it evolve over the years. In the early days, it was a collection of applications which you could purchase individually. Today the applications are more tightly integrated than ever, and this works very well. It feels a little like the modules in Lightroom and makes a very competent replacement. The On1 Browser has been around for some time, which shines through in its design it’s designed. This is an important point when considering any Lightroom alternative. If the software isn’t well designed you won’t find it easy to work with and you won’t want to replace Lightroom. On the left-hand side, there are the controls used to select the folder you want to browse. You’ll also find your filtering tools here which allow you to quickly filter the thumbnails displayed in the central area of the screen (discussed next). A further nice touch is the presets found in this area. Initially, I was sceptical of the value of having them on this screen, but they can be a time saver. There are lots of film simulations as well as the ability to apply your own presets quickly to large numbers of images. In the central area is a thumbnail grid displaying the thumbnails of the images in the selected folder or album. The frame around each thumbnail feature’s tools and like Lightroom you can apply colour labels or star ratings to images. Right-click on an image and you will see a popup menu with many other controls and organising options. As you work, the smart albums within On1 update to hold the images that match the criteria. An example of this is the 5-star album which holds all photos you’ve applied a 5-star rating to. If you’re familiar with the Smart Collections in Lightroom, you will recognise this feature immediately. Over to the right-hand side of the screen, you can see the Metadata for the currently selected photo. This provides a well-organised view of the metadata and enables you to edit the usual fields such as contact and copyright information. Importantly you can also apply keywords to the images although the tools to support this are quite basic. The On1 Browser is a good replacement for the Library module in Lightroom. If you intend to do a lot of keywording with the tool, do check this feature is sufficiently powerful to meet your needs. It is though worth checking the latest version as On1 continue to develop the software, making it a strong Lightroom alternative. The Develop feature of the On1 software is very similar to the Develop module in Lightroom. It’s designed for adjusting and correcting photos (either RAW file or supported image formats) and provides all the tools you would expect. When it comes to developing RAW files, the image quality is good, the tools are easy to use, and the features make it a viable Lightroom alternative. Again, we see the presets which you can browse and easily apply to your image to produce a starting point before further enhancement. On the right-hand side of the interface are the development tools in two tabs. One tab applies global adjustment across the entire photo whilst the other set applies adjustments locally. You apply the localised adjustments using a mask, allowing you to paint the adjustment in or out of the image. A nice feature of this is the localised adjustments support layers and each layer has its own mask. This makes for a very flexible system which is easy to use. The On1 tools described above are enough to make it a strong Lightroom alternative, but there’s more. Personally, I find the best features of On1 are the special effects filters which you can apply working with the Effects and Layers modules. These contain a lot of filters and presets which can create some very beautiful results. Combine this with the extremely powerful masking tools and you have an excellent and very capable editing system for photographers. You can download a trial version of the On1 software from the On1 website. At this point, it was my intention to create a summary of recommendations and rank the three packages. Having finished writing this review, I’ve decided not to do this. Each of the packages mentioned in this review is very capable and a viable Lightroom alternative. But which will be best for you is a very personal decision. You might have very different needs and priorities to me. The only recommendation I can really make is to create your own list of important features (as I describe in my article on selecting a photo editor). Once you have this, download the trial version for each and evaluate them against your criteria. 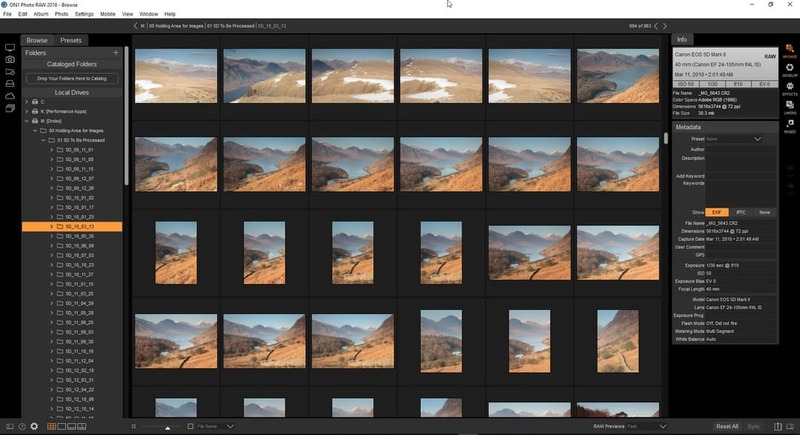 Hopefully one of these Lightroom alternatives will meet your needs. Many thanks for yet another excellent article. I use Lightroom & Photoshop but, like others, I’m beginning to think it would be cheaper in th long run to move to one of these other alternatives. The one thing that I’m bothered about, though, is that after spending many hours organising photos (stars,colours, etc) will this work be lost if I switch to another brand – or will it all transfer seamlessly? All the information you mention is in the Lightroom catalog rather than embedded in the image. This means you will need a few steps to transfer it to your chosen solution. How to do this will depend on the software you select. Many such as Alien Skin and On1 have developed Lightroom plugins that handle the process for you. It’s worth checking their websites as well because they have articles explaining what to do. It’s not seamless but it’s easier than it used to be. I’m one of those who don’t like Adobe’s current business model. I have almost totally replaced Lightroom with DxO’s Photolab. I find it is a great alternative, with all the tools I need and which are often easier and quicker to use than Lightroom’s. I also have Phase One’s Capture One – more complex but very effective. Just two more alternatives for people to consider. Thanks for the suggestions. I wasn’t trying to cover all the options here as it would have taken much more time than I have available. They are though good suggestions although for me, until DxO support Fuji RAW files I won’t be investing in Photolab. It’s a shame really as it’s a very nice piece of software. I bought Onone some time ago but didn’t use it for long. The develop module is slow and clunky compared to Lightroom. With Lightroom you move a slider and it happens. With onone you move a slider and wait … and wait … or have to release the slider to get the action to take place. I have not found anything that comes close to Lightroom as yet for speed. Hi Les, at one time On1 was slow but the current version is a lot better unless you build up a lot of layers with complex masks. Unlike you though I find Lightroom a lot slower these days and often slower than the alternatives here. ACDSee is noticeably faster on my PC than Lightroom 7.5. Hello Robin, thanks for a very useful website, and helpful summary. Like many, I’m working with Lightroom, but always looking for alternatives. I’m currently storing my catalog and images on an external HDD, which I then plug into either my desktop iMac when at home, or to my MacBook Pro when travelling. All edits, and collections are therefore preserved (except the recent preset relocation gotcha from Adobe which needs a manual copy/paste workaround). So whilst I would drop the need for both PC and Mac versions, I would add the need to work seamlessly across multiple computers, potentially offline. And so far, it seems that is Lightroom’s killer functionality. all the others can browse the folders and read xmp edits, none seem capable of sharing albums/collections/smart collection criteria. There are different approaches used by the applications. Yes, some use XMP files but others do have the option of creating and holding versions in catalogues. Yours arroungement sounds quite specific in how you want this to work and it would be very difficult for me to make specific recommendations. I would suggest the best option would be to try alternatives to see how/if they could be configured to meet your needs. I am surprised you didn’t mention Photo Mechanic in this. Not much for editing, but a rock star catalog. Photo Mechanic may be good for organising images but as I said in the introduction, being able to edit the images was important to me. Because of this I wasn’t going to choose an alternative that only allows me to organise the images. One feature you didn’t list is customisable export presets. If I upload a photo to photo print service A they accept PNG files and Adobe RBG colour space. Another requires Jpg and sRGB. To Flickr I limit image size, add a copyright watermark and frame containing my website details. To an image selling site I supply full res but with certain extra meta data added. Etc. I have a lot of these and looking them up and doing the tweaks by hand would add hours to simple workflows. 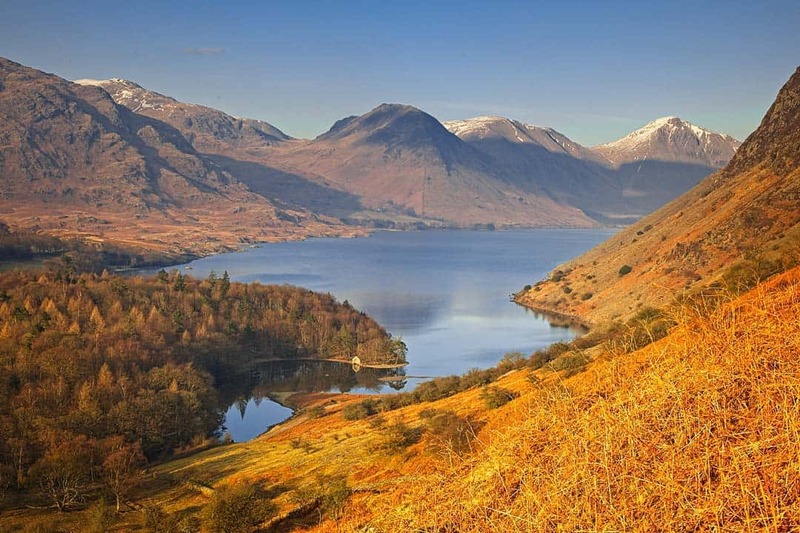 Automated connections to Alamy, and other photo libraries are nice, even if supplied by plugins. I am sure other softwares cover the functionality but to what extent and what is the availability of plugins?